As many of the followers of ColbyDigsSoil.com know, I’ve been working on my PhD in soil science at NC State for a while now. I’ll be finishing up in December, so I’ve been in the midst a thorough job search over the summer and the beginning of the fall semester. That job search is officially over now as I have accepted a position as a postdoctoral researcher in the University of Washington Civil and Environmental Engineering Department. I will be working with Dr. Rebecca “Becca” Neumann. I will be working on a project studying methane oxidation in the rhizosphere of wetland plants. Methane is a greenhouse gas that is 20 times more effective at trapping heat in the atmosphere than CO2. Methane is produced in wetland soils. Plants can act as both a route for methane to move from the soil into the atmosphere, and as a way for oxygen to enter the soil and oxidize the methane in the rhizosphere (the zone of soil immediately surrounding roots). The objective is to put a solid number on the percentage of methane that’s oxidized in the rhizosphere in order to refine climate change models. We also want to predict how that number changes with different plant communities, and how those communities might change as the climate warms. 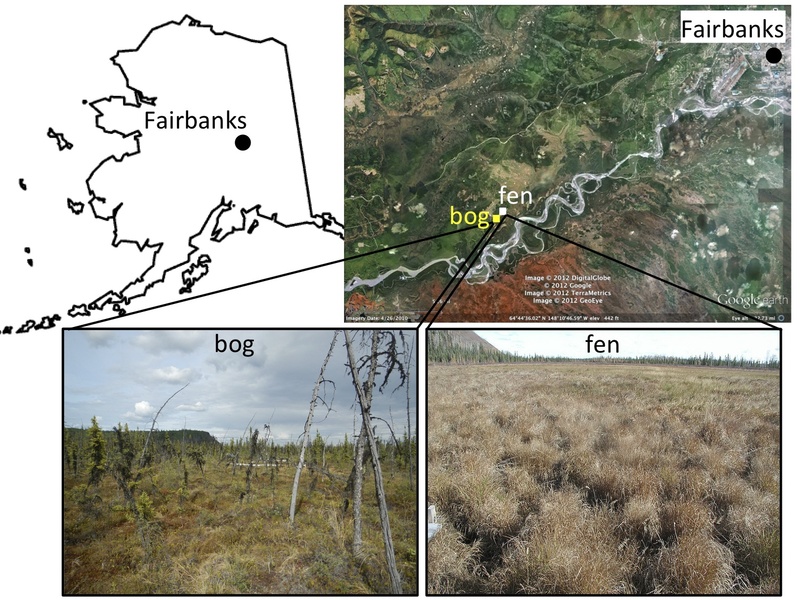 The field site is about 40 minutes west of Fairbanks, Alaska. The field site has two types of wetlands – a bog and a fen. It is called the Bonanza Creek Long Term Ecological Research Station. I’ll be in Alaska for their growing season (June-September), and in Seattle the rest of the time working on laboratory experiments. The position is exactly the type of postdoctoral research position I was looking for in my job search, so I’m really happy I got it. My wife and I are both excited to see what the West Coast is like, and we now have an excuse to visit Alaska. My start date is January 6, so my wife and I will be moving over the holidays. This new stage of my career will affect this blog a little bit. My first priority is to finish and defend my dissertation on time in December, so I won’t be able to add many blog posts between now and the end of the year. However, once I make the move I should have all sorts of interesting material and pictures from Alaska to post on this blog. This entry was posted in Colby's Career News, Colby's Research, News. Bookmark the permalink. 2 Responses to New Job! All the very best as you move west for your next soil adventure! You’ll be missed as one of our favorite Envirothon Mentors! Your “Colby Digs Soil” blog is soils sensational. Thank you for the tremendous time and effort in developing this to advance soil science literacy! Thanks for the kind words, Sheila. I’ll miss helping out with Envirothon each spring.